- Temperature and RH from 5% to +95% at temperatures between 0 and 60′C. 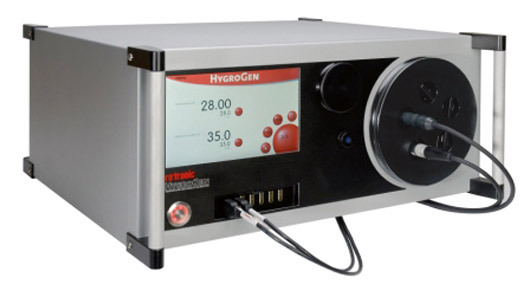 We use the Rotronic Hygrogen 2 which can calibrate RH/temperature sensors at multiple points effortlessly with a very good uncertainty. - Capability to calibrate probes from Vaisala, Rotronic, ETI and others. In addition, the chamber allows for integrated models i.e. Tinytag to be placed into the chamber.